Once you have all the ingredients for this Szechuan Noodles dish by Ina Garten it is a real cinch to make. I often have most of the ingredients on hand, but sometimes I will make some alterations when I don't -- and it still turns out well (this time I cut the recipe in half and used whole wheat noodles). I love the sesame peanut flavoring and it is not overpowering, a great spring/summer dish. Mmmm, I think I must plan to make that this week! Looks delish! That looks mouth watering. Yummers. that looks like such a great light summer dish. thanks! 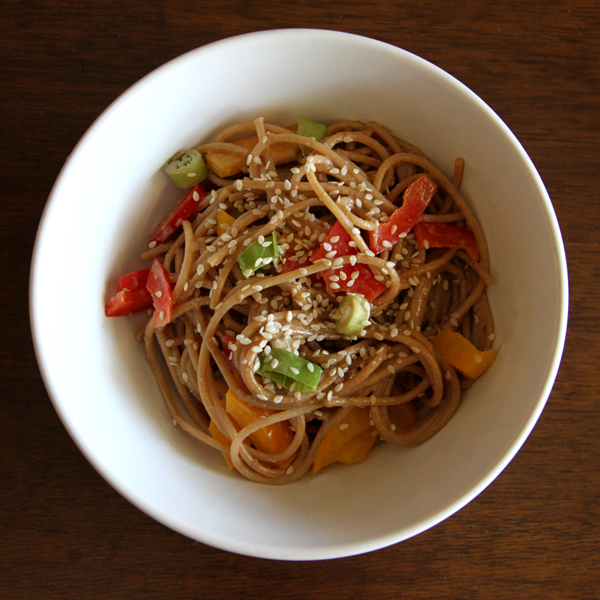 i have a smilar recipe for these cold noodles and they are to die for. i could literally eat them daily! Looks yummy. I happen to have soba noodles in my cupboard. I'll try them with the recipe! Yummm that looks so tasty! All I can say is NOM NOM! I just made this too. It such a great recipe..full of flavor. I add grilled chicken. I love all of Ina's dishes - Will have to try this one!! Yummy! I love noodles recipes, thanks for posting this one! mmmm.... miamiiiiii... i want this now, please!